Iran’s Foreign Minister Mohammad Javad Zarif has proposed the formation of a forum with the participation of Persian Gulf Arab states in order to build a common goal toward overcoming problems. “Countries in the Persian Gulf region need to surmount the current state of division and tension and instead move in the direction of erecting realistic regional arrangements. It can perhaps start with a modest regional dialog forum,” he said on Sunday. Zarif addressed the Munich Security Conference, an annual gathering of top diplomats and defense officials, urging Arab states to work with Iran to address “anxieties” and violence across the region. Iranian President Hassan Rouhani last week traveled to Oman and Kuwait to improve ties, his first visit to the Persian Gulf states since taking power in 2013. “On regional dialog, I’m modest and I’m focusing on the Persian Gulf. 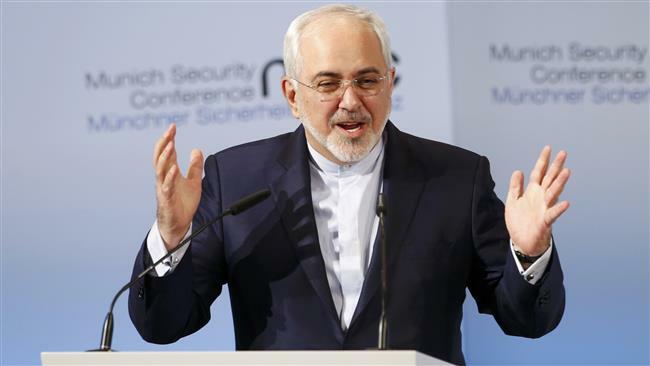 We have enough problems in this region so we want to start a dialog with countries we call brothers in Islam,” Zarif said. “We need to address common problems and perceptions that have given rise to anxieties and the level of violence in the region,” he added, when asked whether Tehran would also consider a region-wide dialog. Zarif earlier criticized four-decades of well-financed “Takfiri” ideology which has its roots in Saudi Arabia and is followed by extremist groups such as Daesh, al-Qaeda and al-Nusra Front. Saudi Arabia unilaterally severed ties with Iran last January after protesters in Tehran and Mashhad attacked its diplomatic premises following the kingdom’s execution of prominent Shia cleric Sheikh Nimr al-Nimr. Some of Riyadh’s allies followed suit and cut or downgraded their ties with Iran. It was choosing regional enmity, Zarif said, that had in part spawned such extremist outfits such as Daesh and al-Nusra Front. “For nearly four decades, a well-financed global proliferation of Takfiri ideology based on division, hatred and rejection, which everybody would agree has nothing to do with Islam, has been sold as promoting a so-called ‘moderate Islam’ to confront an erroneously-framed ‘radical Iran,” he noted. The other contributors to the rise of such groups were “the endemic problem of foreign occupation and invasion,” and their arming and financing by some states in the region, Zarif added. As a case in point testifying to “the success of diplomacy over coercion” is the 2015 conclusion of a nuclear agreement between Iran and world powers, he said. Zarif brushed aside new pressure from the United States, declaring that his country is “unmoved by threats” but responds well to respect. President Donald Trump has adopted a harsh language towards Iran, threatening to “tear up” the nuclear deal, calling Iran “terrorist state number one,” and imposing new sanctions against the Islamic Republic. “Iran is unmoved by threats. Everybody tested us for many years — all threats and coercions were imposed on us,” Zarif added. The minister once again dismissed any suggestions Iran would ever seek to develop nuclear weapons. He mocked “the concept of crippling sanctions,” which he said merely ended with Iran having acquired thousands more centrifuges, used for enriching uranium. The Munich event discusses such issues as the future of the US-led military alliance of NATO, world order and security, terrorism, extremism, and various regional matters.